Hey there! 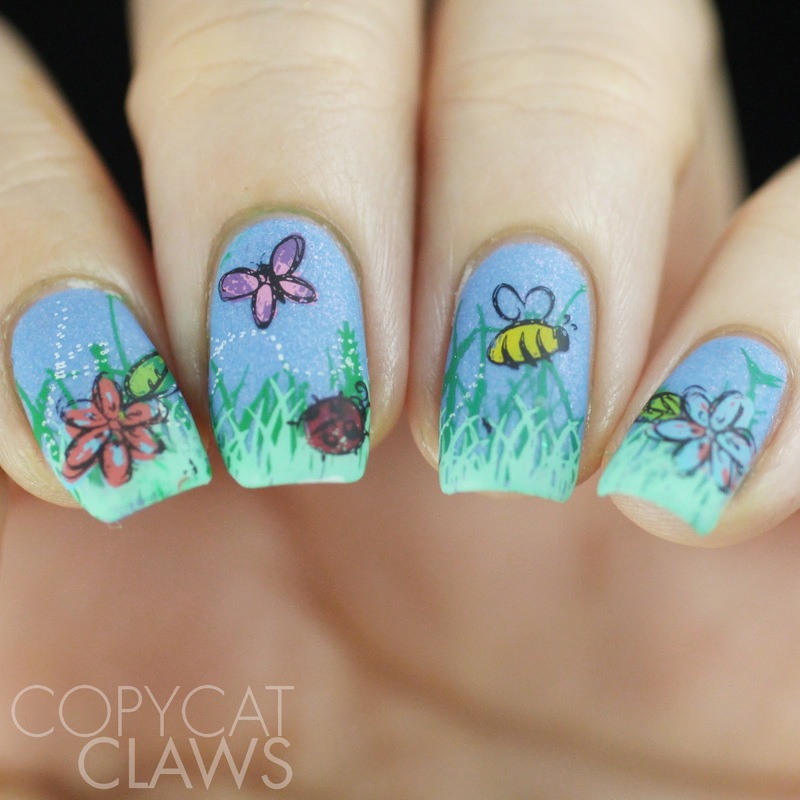 Since I'm chilling enjoying this Easter weekend, I thought today would be a good day to show you a spring-themed plate from Whats Up Nails. The B017 plate (aptly named Spring Elation) has a bit of everything for this time of year. There's some Easter and St. Patrick's Day images and a whole lot of images all about nature. Those are my favourites so I used two of them here. I didn't even realize until just now that I did double stamping for both of them. Hey there! 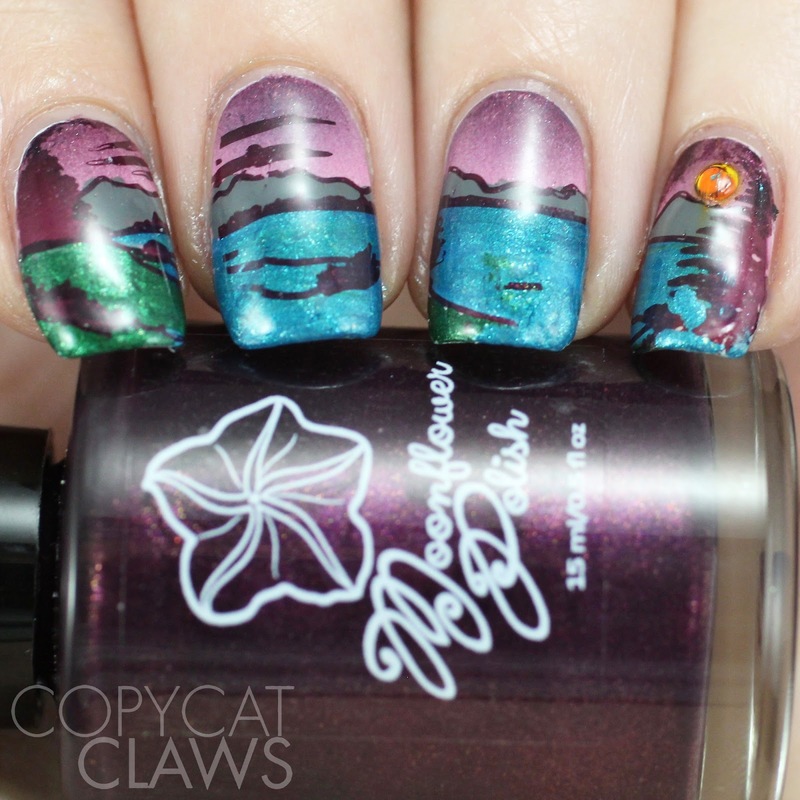 I'm just popping in today to share a pond mani for this week's 26 Great Nail Art Ideas prompt. These were inspired by Manicured & Marvelous' snowflake pond mani from a couple years ago. I've never done a pond mani with a sheer white and I really like it. Not nearly as much as hers but it's still pretty cool. Hey there! Just yesterday I posted some swatches of the pastel stamping polishes Hit The Bottle recently came out with (if you didn't see those, that post can be found here). Today I have some colors from the other side of the spectrum - neons! Before the pastels, Michelle released the Pour Some Neon On Me collection so I bought them both from Beautometry at the same time. 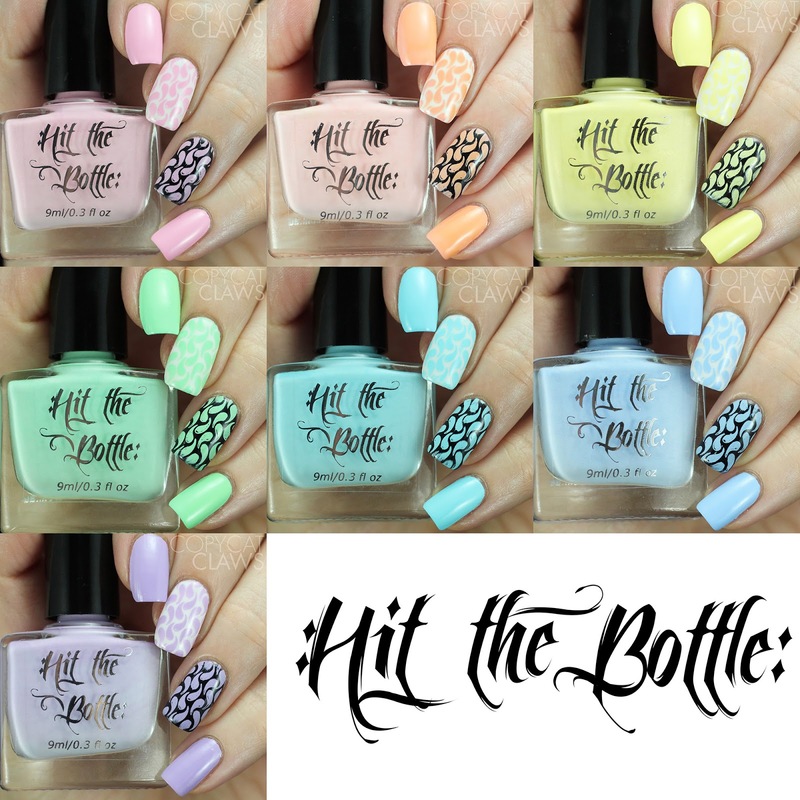 As with yesterday, I'll link to where I purchased them but Hit The Bottle does have international stockists which can be found here. Hey there! 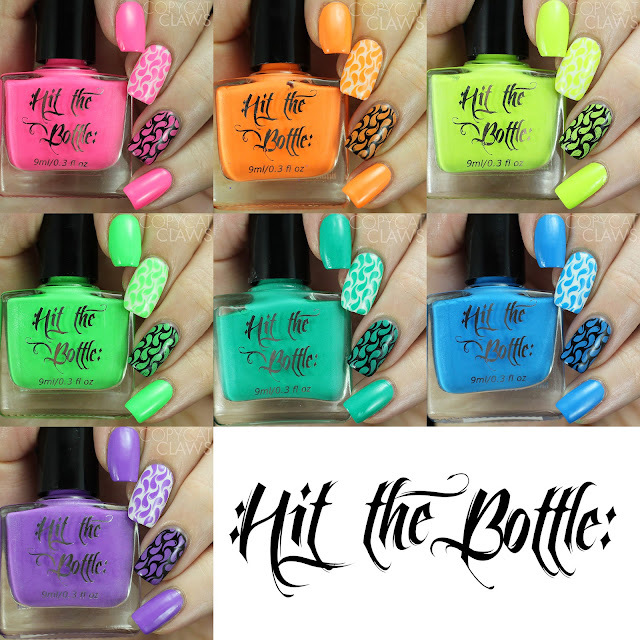 I recently purchased the newer sets of Hit The Bottle stamping polish and thought I would swatch them in case any of you guys were interested in how they stamp. First up I have the pastel collection named Fruit Tingles. Since I've never heard of a Fruit Tingle I just googled it. It appears to be a candy in Australia which makes sense since Hit The Bottle comes to us from Australia. Michelle can't ship internationally from Australia so I get them through a US stockist, Beautometry. The links I include here will be to the Beautometry site since that's where I bought them from Hit The Bottle does have other international stockists which can be found here. Hey there! 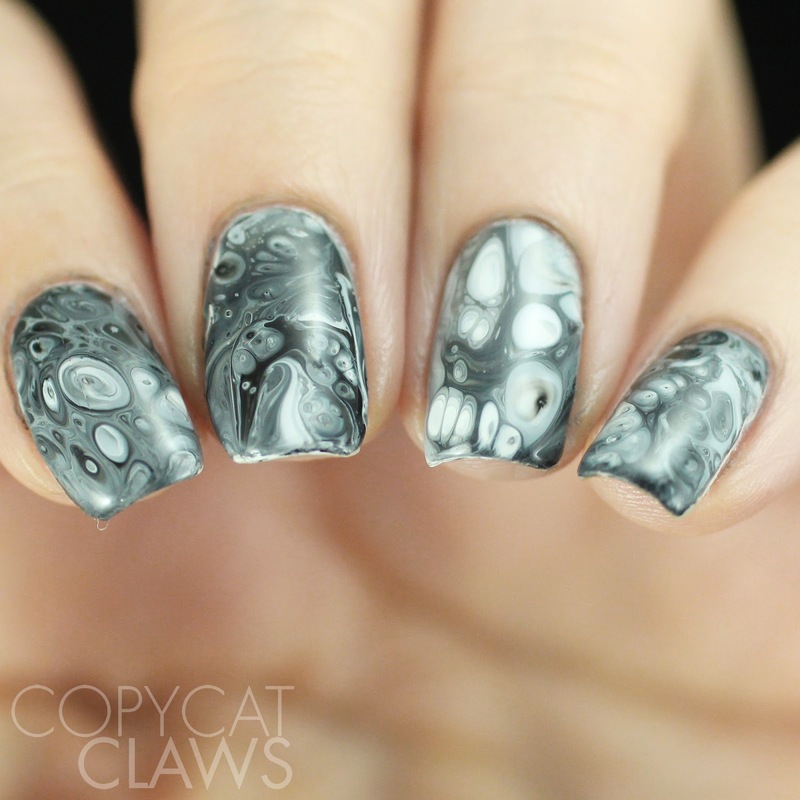 I have a quick post this evening to show you a stamping plate, BM-XL176, that I received from Bundle Monster. I had actually requested this plate because I thought it had great individual images to try out with the Pencil Stamper I reviewed last month (you can see that here). Unfortunately the images were too big for the pencil stamper but I still love the plate as much as I knew I would. I soooooo can't dance but that doesn't mean I don't car dance, chair dance or just regular ol' dance around work and home on a daily basis. Hey there! 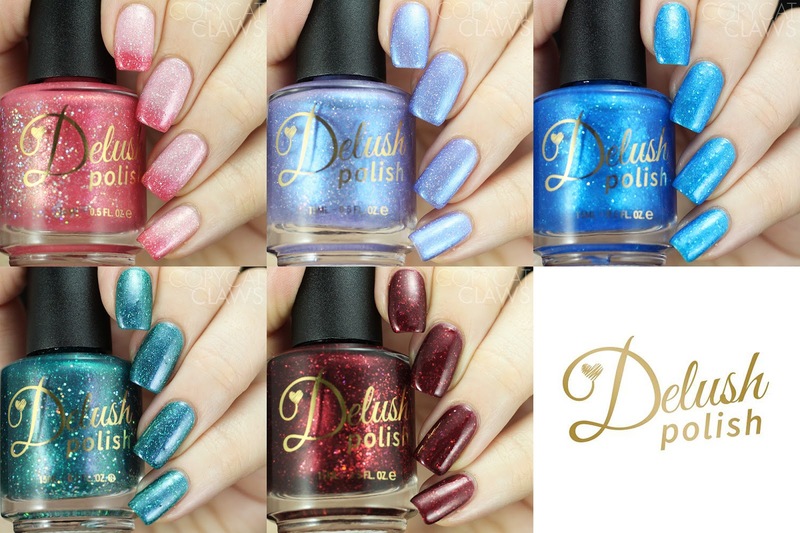 Today I have swatches of the upcoming collection from Delush Polish, the Crown and Glory Collection. This collection is inspired by the TV series The Crown. I haven't personally watched the show but this collection has put it on my list. If Adrianna was inspired by a show to come up with creations this beautiful, it must be worth watching. The collection has a possibly my favourite thermal polish I've ever tried, lots of holographic flakies and so much shimmer! I have plenty of swatch photos so keep reading. Hey there! Today's Nail Crazies Unite prompt is one of my all time favourite things - sweet fruit. I'm an absolute fruit junkie. I think that's why the winter months are so sad to me. I don't have access to delicious fruit. Sure, I can still get it at the grocery store but it's not nearly as good as the farmers market fruit of the summer. But since it's still very winter-y here, I wasn't fully feeling the fruit theme. I ended up going with a fruit I'm not even particularly fond of. 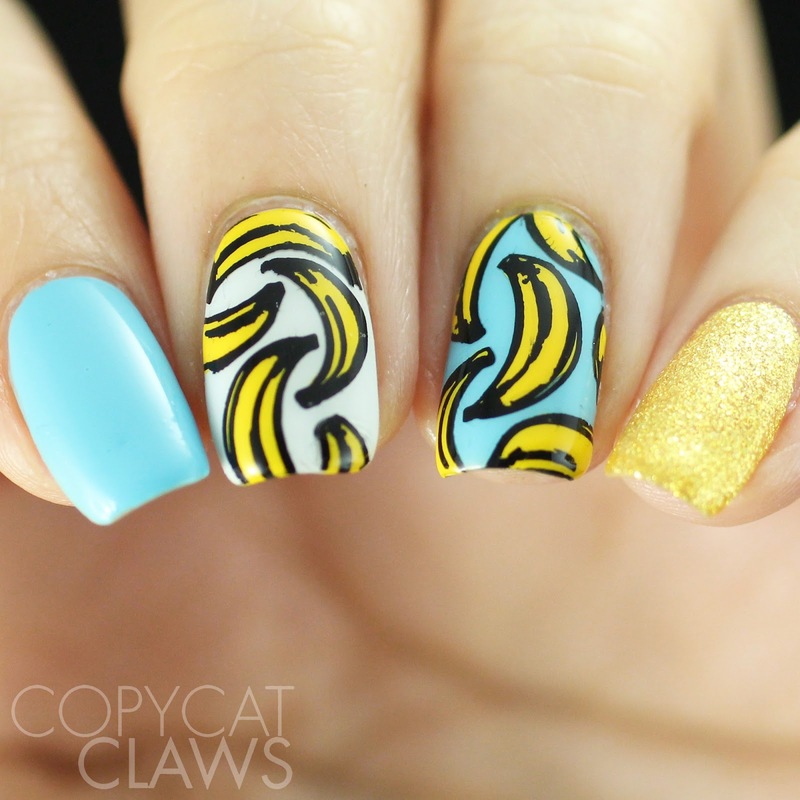 Does anyone truly like bananas or are they just handy? Hey there! 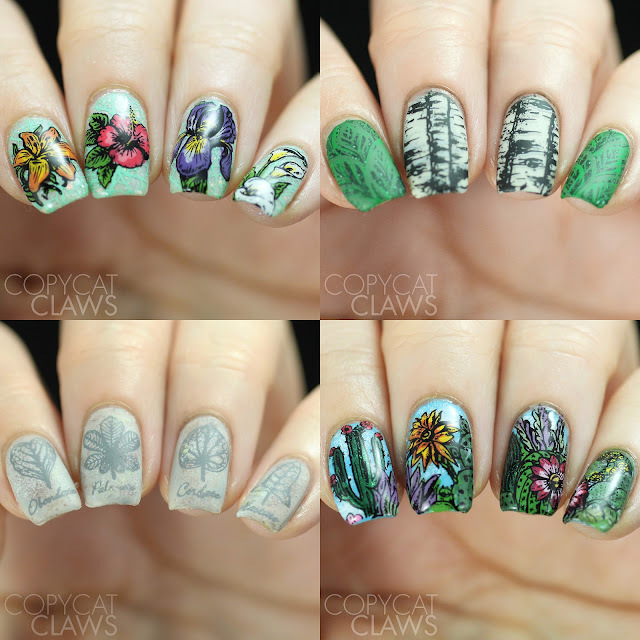 Today I have the latest collection of stamping plates from UberChic Beauty to share with you lovely folks on the first day of spring. This is Collection 24 and it has lots of images that remind me of spring. Or maybe right now everything reminds me of spring because I'm sick to death of winter. Seriously though, the layered butterfly image on 24-01 is one of my favourites ever. I've always had a soft spot for butterflies so this one jumped out at me. But it's not the only thing I liked about this set. It has everything I like about UberChic's collections - a good mix of layering and negative space, geometrics and more... Plus, their quality is always great. That's the most important thing! Hey there! I'm popping in for a quick Saturday post before any St. Patrick's Day festivities. A few days ago I got an envelope from Whats Up Nails with lots of stencils and plates including some St. Paddy's Day stencils. I had time to use some of them this week so I thought I should share them before the big day is over! As always, I had really good luck with their stencils. I would recommend almost all of their stencils. Hey there! 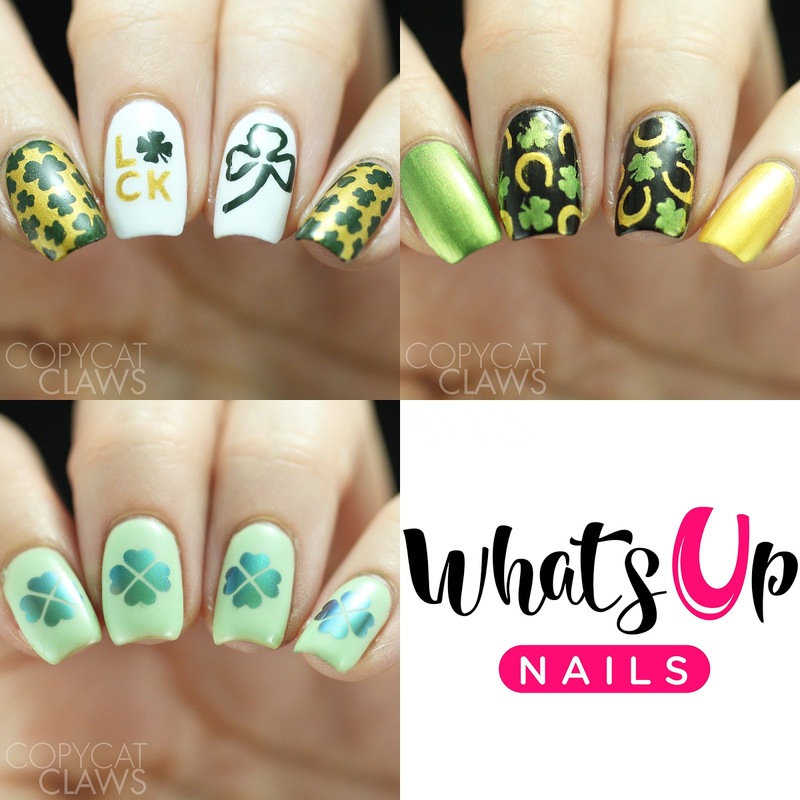 We've come to the end of The Digit-al Dozen's Stamping Week which just so happens to fall on the same day at 26 Great Nail Art Ideas theme of "French With A Twist". French manicures are traditionally freehanded or use vinyls (at least as far as my limited knowledge goes) so my twist was that I stamped the french tip here. 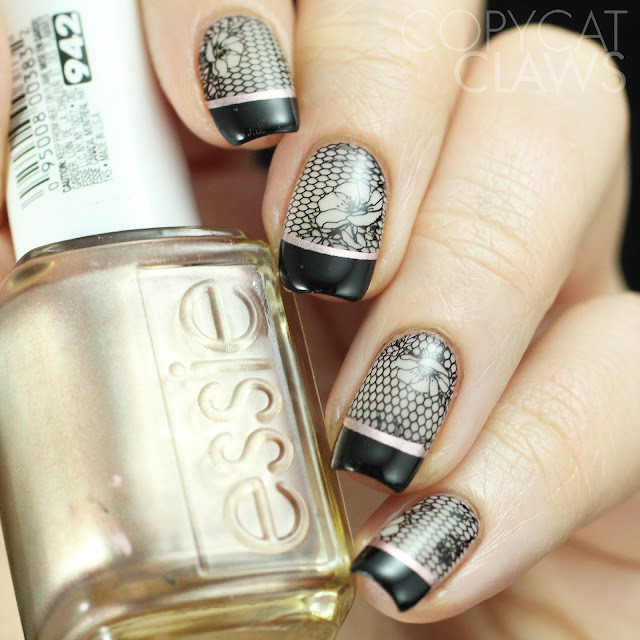 I will say that plates with french tips combined with clear stampers make french manis WAY more appealing to me. When I've tried to do french manicures in the past, I ended up with sort of blobby looking tips because I use too much white so it gets thicker....it's really not pretty. Since stamping using a really thin amount of polish, the end doesn't get thick. Unfortunately it also means it doesn't wear very well but it got me through a day at work which is good enough for me! Hey there! A couple weeks ago I posted about Sunset, the Moonflower Polish shade created to celebrate her shop's first anniversary. 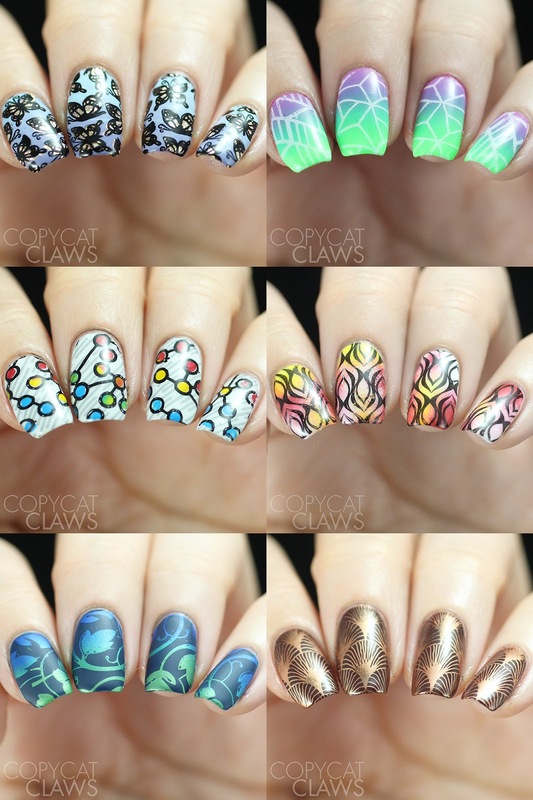 Today I have swatches of the upcoming Spring Holos collection AND the recent Vampy Cremes collection. These two collections really show how talented Nadia is. She's come up with two great sets of stamping polish that both work so easily but that are so different in their finish. I really like them both but there's something particularly stunning about the spring set. They're holo and kind of shifty and metallic. That being said, there will never be anything better than cremes for nail art so I'm so happy to have both collections. Stick around to read all about them all. Hey there! 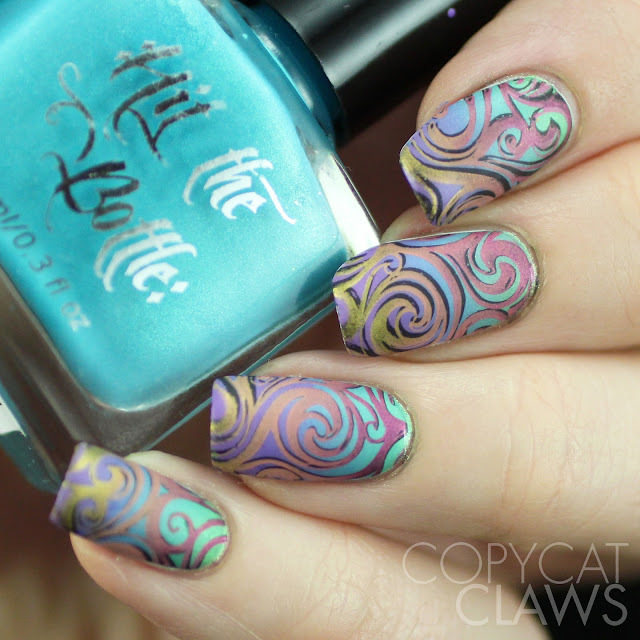 As much as I love stamping, sometimes I forget about some of the cool techniques we do to get fun images on our nails. So for the Digit-al Dozen's stamping week, I decided each day was going to show a different technique. 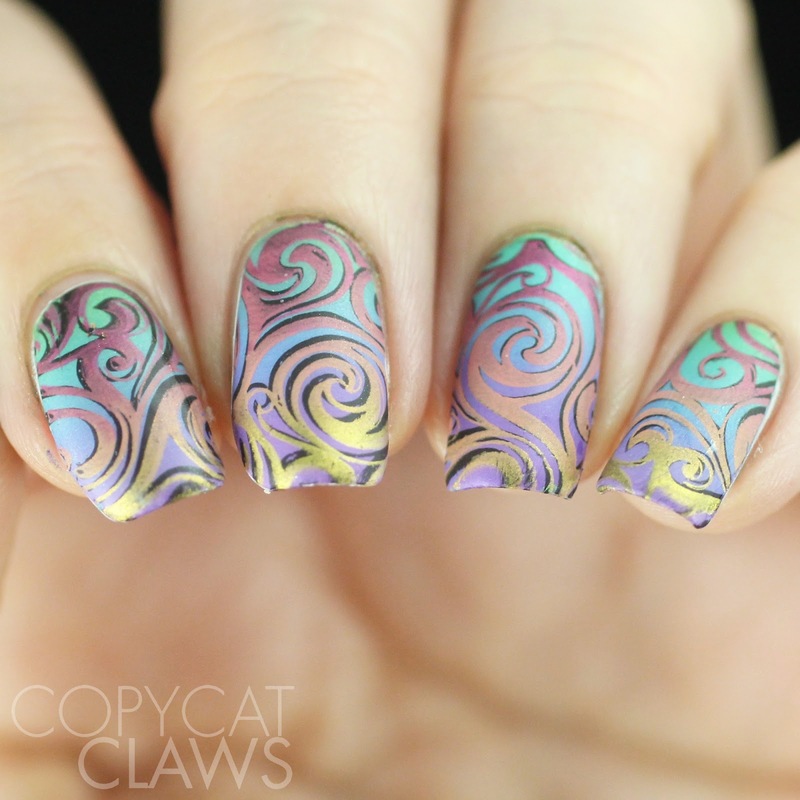 Here I have a relatively new one - stamping with powders with just a side of a gradient. 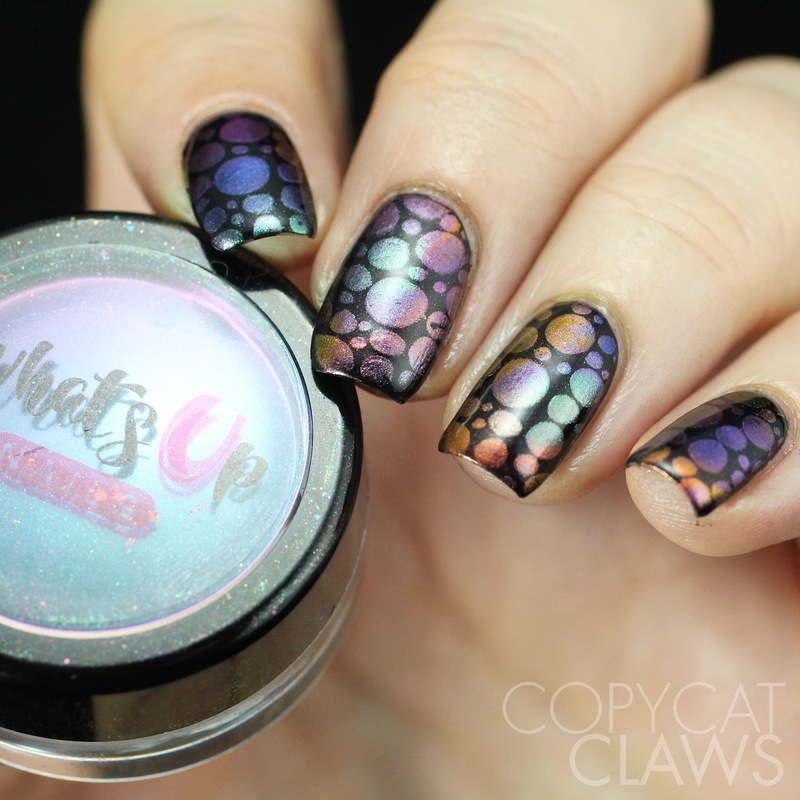 I find the Magic Shifting Powders from Whats Up Nails to be the best on the markets so that's what I used here. Hey there! I know, I know, it's way too late to be blogging tonight but I just have to get my Day 3 Digit-al Dozen Stamping Week post up before I go to bed. Why am I late? We wanted to go for pizza for Pi Day but it was so crazy busy that we ended up out for dinner at Nando's. It was fun but all I could think of is all the blogging I've been falling behind on and all the items I've received in the last two days to review. It's gonna be a BUSY weekend coming up! But for today's stamping mani I did some layered stamping using Clear Jelly Stamper's plate and Big Bling. I was hoping it would be spring-like this week but, while it is warmer, it's still snow-covered so spring certainly isn't here yet! Hey there! 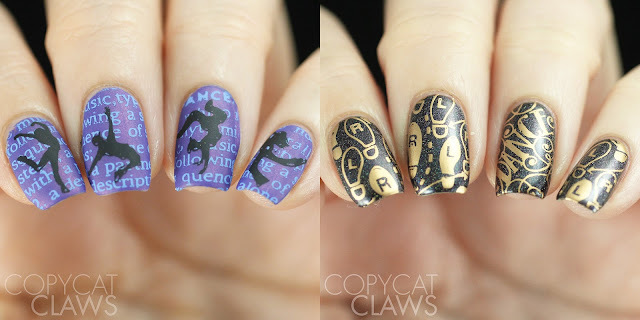 It's Day 2 of the Digit-al Dozen's stamping week. The technique I picked for today is a super easy one...yet it took me two tries to get the mani I pictured in my head. Here I used gradient stamping for both the base AND the image, both on the same plate...how handy!. 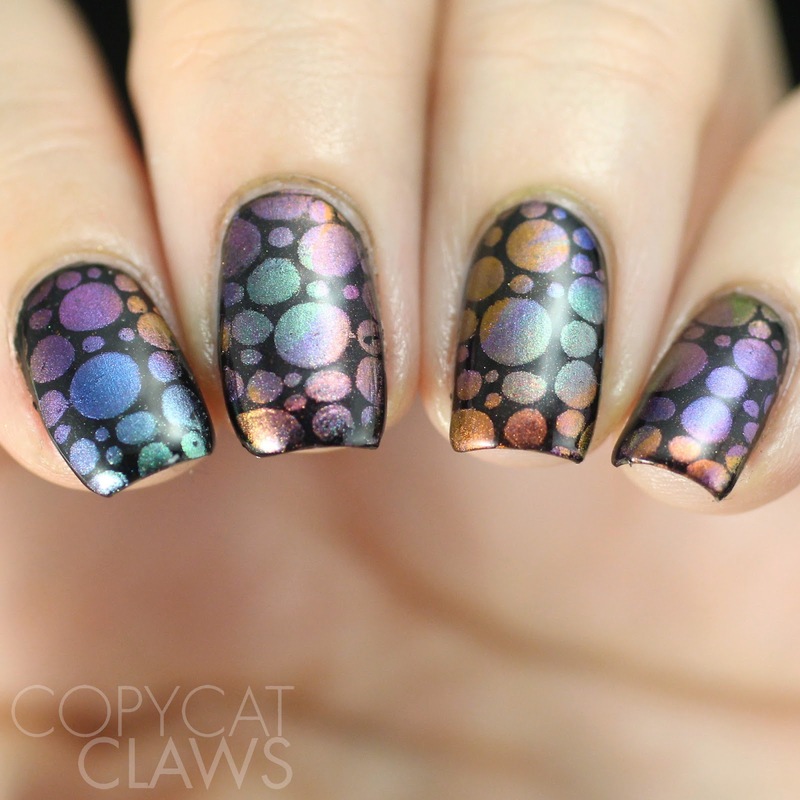 I knew I wanted a whole rainbow of color but for the first try (which you can see at the end of this post) I used holo stamping polish and all that sparkle hid the color differences. So I did it again the next time and ended up with exactly what I wanted. Hey there! Can you believe it's already time for a new Digit-al Dozen week? The last one just ended a couple weeks ago but the timing worked out that this is the week for March. I'm not complaining since this month's theme makes me so happy. This week we're all doing stamping! There's quite a few stampers in the group so I think a bunch of us are pretty pleased with it. 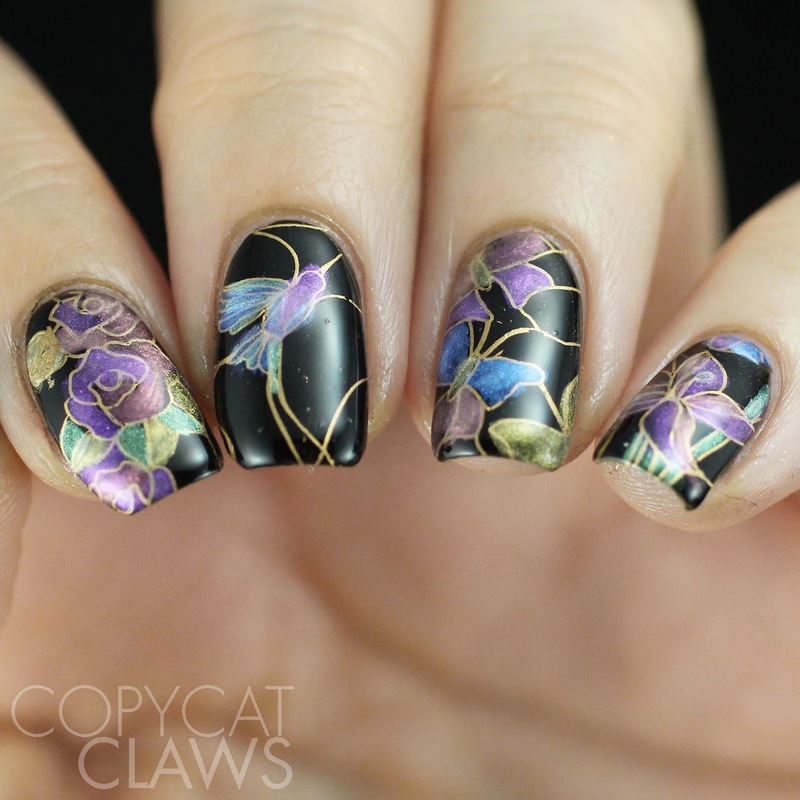 Rather than just show 5 random stamped manis of mine, I tried to come up with 5 different stamping techniques for my designs this week, starting with leadlighting. Normally leadlighting is done with sheer polish over a light base (otherwise the color won't show) but I tried it with some shimmery polish that I bought from Born Pretty Store. It's practically clear on its own but it's super pretty over black. I'm so happy with how these turned out! Hey there! 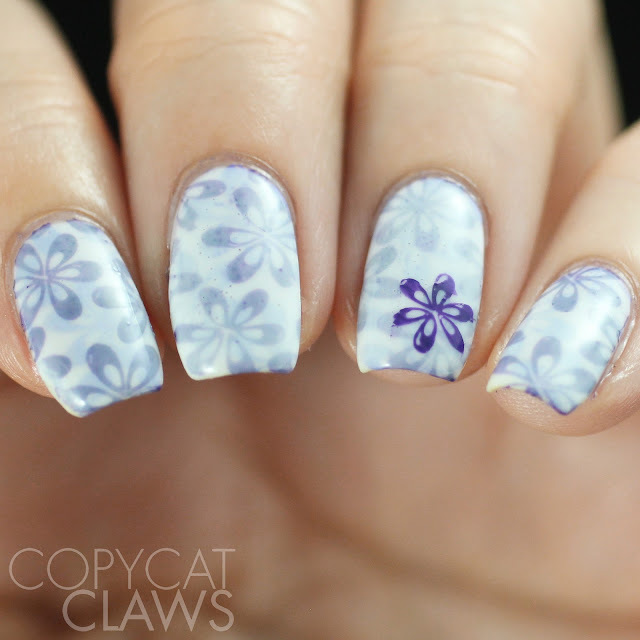 I'm back today with another stamping plate review. The Bundle Monster Botanicals Collection is perfect for spring but absolutely not your typical spring collection. The surest sign of spring to be is the plants coming back to life after a winter under the snow (at least that's the case here) and this collection is dedicated to all things plants. The images lean more towards the realistic than the cartoon-ish. There's some of the prettiest florals I've ever seen on stamping plates here. 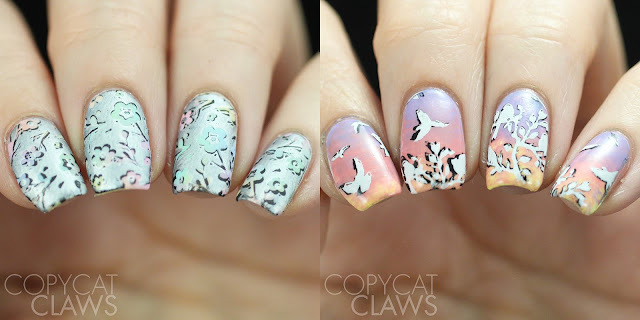 So pretty, in fact, that I couldn't resist doing two reverse stamping manis which definitely turned out to be my favourites. 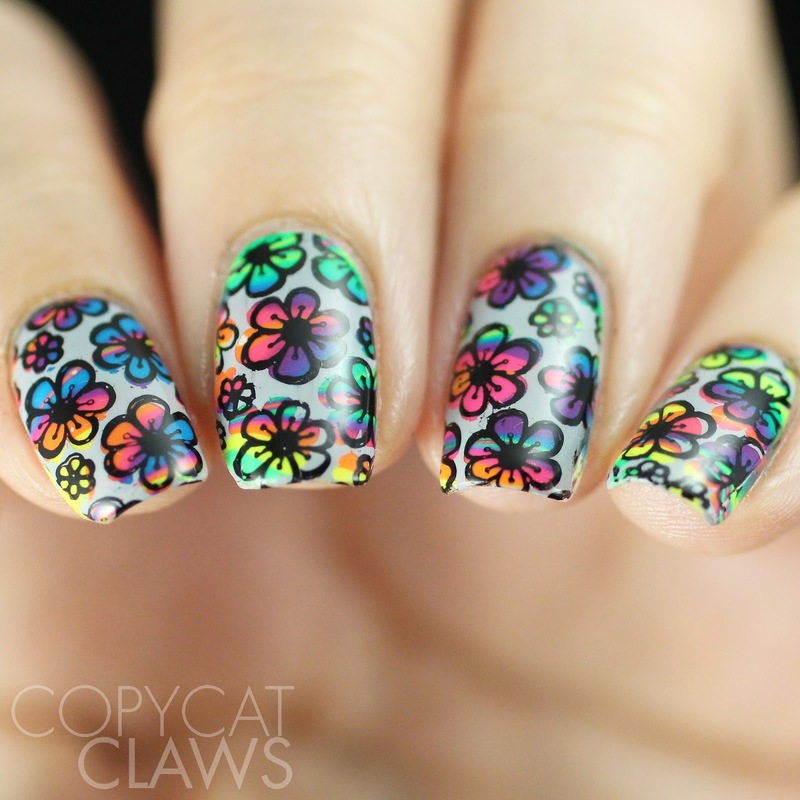 I do love me some colourful nail art! Hey there! 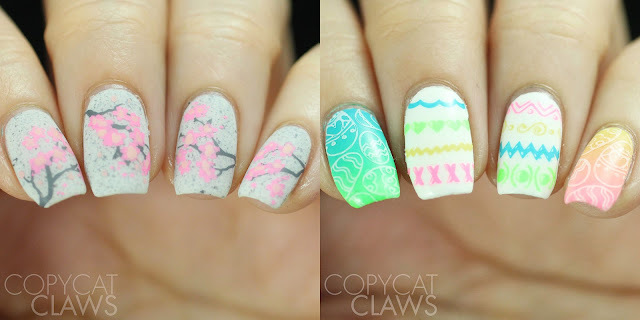 Just a few days ago, UberChic Beauty released it's Welcome Spring stamping plate, only the second spring-themed plate to date. I received it on Friday and tried out a couple manis with it this weekend. I really like UberChic's spring plates because it's not only spring or Easter but a mix of both. It's kind of like one-stop shopping for the season! Hey there! This afternoon I have a celebratory post for one of the best new(ish) brands out there. 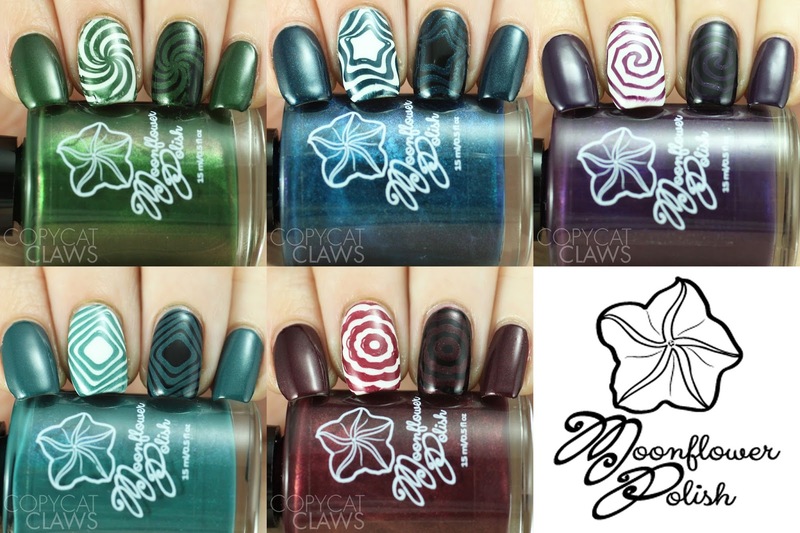 Moonflower Polish (the brain child of Nadia of MamaHeartsPolish) is one year old! To celebrate, she has come up with a special polish called Sunset. 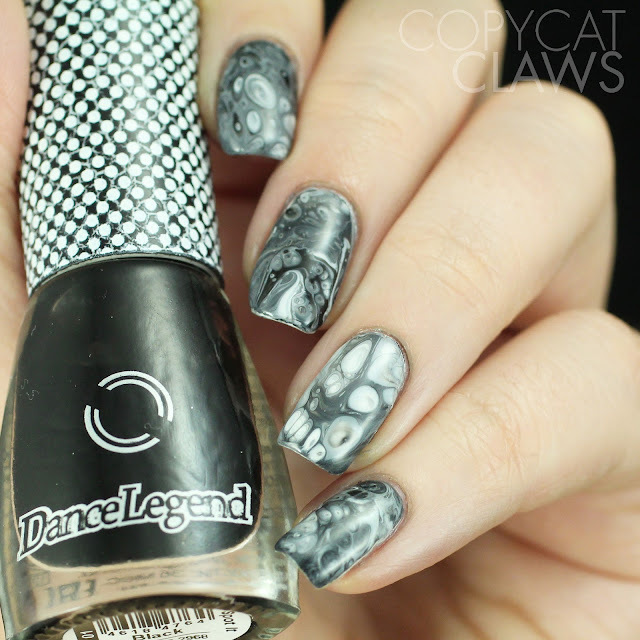 It started with a franken of an old drugstore polish back in the day but since she has all sorts of nail polish skillz now, she figured out how to make it from scratch AND make it opaque enough to stamp. I played with it a bit last week, by swatching it, stamping it and stamping with it. Stick around and you can see all three!. Hey there! The design I have for you today is possibly the most commented on (in real life) mani I've done in ages. Keep in mind, these were only commented on by my coworkers who are normally pretty blind to my nail polish hobby. I think I know why they noticed them which I'll explain in a second. 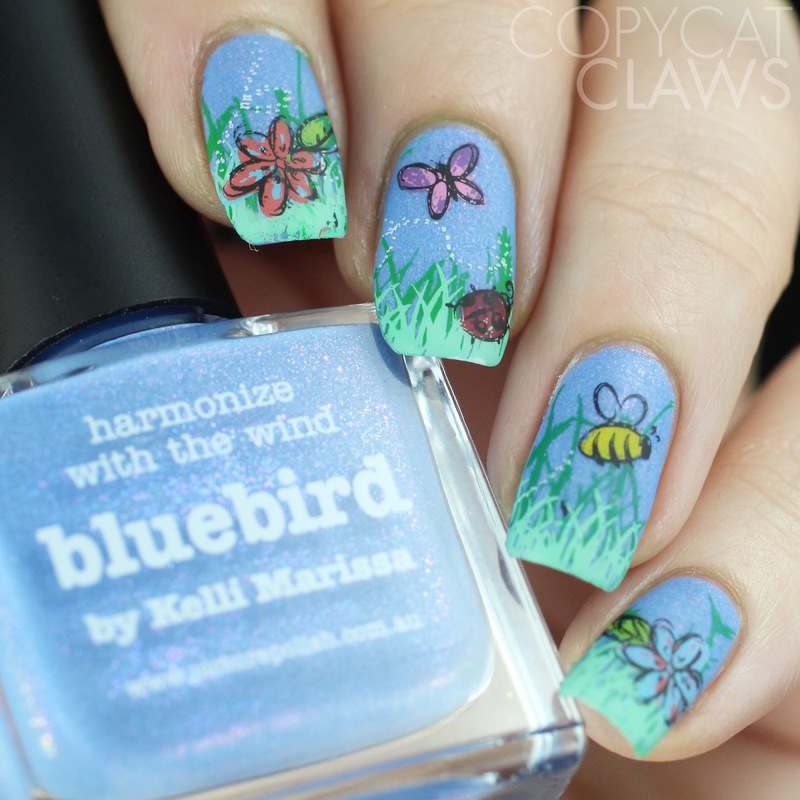 This week's 26 Great Nail Art Ideas prompt was Made On A Mat/Plastic. 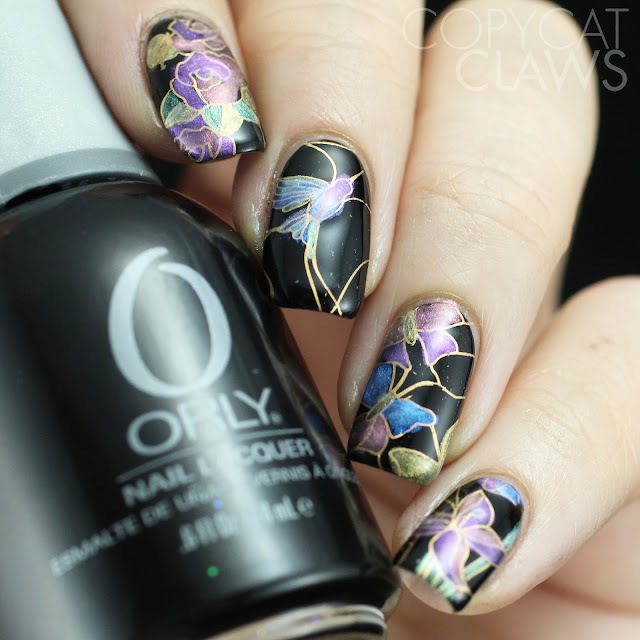 I'd been dying to do some fluid nail art like the amazing Kyong Lee seems to have mastered. I followed her video and came up with some pretty cool "cells". Hey there! 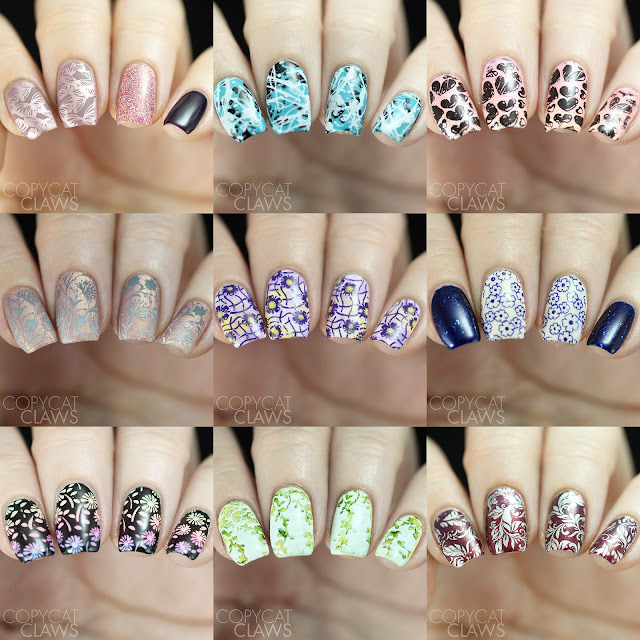 A few weeks ago Lina Nail Art Supplies released a whole pile of new plates, a whopping eight of them which is a really big release. She was kind enough to send me three of them and all three showed me once again why I'm so drawn to her plates. She comes up with such creative, gorgeous images. Lina has quite a few series of plates and I picked the releases my top three series to try out this time, Make Your Mark 07, Four Seasons - Spring 02 and Totally Negative 02. I was feeling inspired so I did three full manis with each plate so this is pretty representative of what I've been wearing out and about since receiving them.